The author of five books of poetry, including Torn Awake and Science and Steepleflower, both from New Directions, Gander also writes literary criticism (The Nation, Boston Book Review, The Providence Journal, et al) and translates. His most recent translations are No Shelter: The Selected Poems of Pura López-Colomé (Graywolf Press) and, with Kent Johnson, Immanent Visitor: Selected Poems of Jaime Saenz (The University of California). 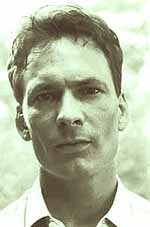 Born in the Mojave Desert in Barstow, California, Forrest Gander grew up in Virginia and spent significant periods in San Francisco, Dolores Hidalgo (Mexico), and Eureka Springs, Arkansas before moving to Rhode Island in 1982. He holds degrees in both English literature and geology. Gander’s poems appear in many literary magazines in the U.S. and abroad, and have been translated into Russian, Spanish, German, Portuguese, and Dutch. He has received two Gertrude Stein Awards for Innovative North American Poetry, fellowships from the National Endowment for the Arts, and awards from The Fund for Poetry and The Whiting Foundation. With poet C.D. Wright and their son, Brecht, Gander lives in Rhode Island where he co-edits the literary book press Lost Roads Publishers. As Professor of English and Comparative Literatures and Director of the Graduate Program in Literary Arts/ Creative Writing at Brown University, he teaches courses on phenomenology and poetry, Asian-American poetry, and contemporary poetics.